European main international traffic arteries are defined by ECE/TRANS/SC.1/2016/3/Rev.1 which consider three types of roads: motorways, express roads, and ordinary roads. Other continents have similar international road networks, e.g., the Pan-American Highway in the Americas, the Trans-African Highway network, and the Asian Highway Network. UNECE was formed in 1947, and their first major act to improve transport was a joint UN declaration no. 1264, the Declaration on the Construction of Main International Traffic Arteries, signed in Geneva on September 16, 1950, which defined the first E-road network. Originally it was envisaged that the E-road network would be a motorway system comparable to the US Interstate Highway System. The declaration was amended several times before November 15, 1975, when it was replaced by the European Agreement on Main International Traffic Arteries or "AGR", which set up a route numbering system and improved standards for roads in the list. The AGR last went through a major change in 1992 and in 2001 was extended into Central Asia to include the Caucasus nations. There were several minor revisions since, last in 2008 (as of 2009[update]). European Route Sign. This sign is used on the E 40. Reference roads and intermediate roads, called Class-A roads, have numbers from 1 to 129. 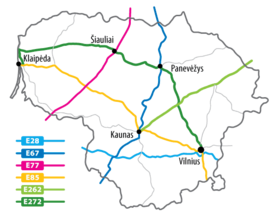 North-south routes have odd numbers; east-west routes have even numbers. Numbers count upward from west to east and from north to south, with some exceptions. Branch, link and connecting roads, called Class-B roads, have three-digit numbers above 130. Reference roads are roads numbered 5-95 ending with 0 or 5 or having odd numbers 101-129. They generally go across Europe and are usually several thousand kilometres long. North-south reference roads have numbers that end with the digit 5 from 5 to 95, or odd numbers from 101 to 129, increasing from west to east. East-west reference roads have two-digit numbers that end with the digit 0, increasing from north to south. Intermediate roads are roads numbered 1 to 99 that are not reference roads. They are usually considerably shorter than the reference roads. They have numbers between those of the reference roads between which they are located. Like reference roads, north-south intermediate roads have odd numbers; east-west roads have even numbers. Class-B roads have three-digit numbers: the first digit is that of the nearest reference road to the north, the second digit is that of the nearest reference road to the west, and the third digit is a serial number. North-south Class-A roads located eastwards of road E 99 have three-digit odd numbers from 101 to 129. Other rules for Class-A roads above apply to these roads. Class-B roads located eastwards of E 101 have 3-digit numbers beginning with 0, from 001 to 099. In the first established and approved version, the road numbers were well ordered. Since then a number of exceptions to this principle have been allowed. Two Class-A roads, namely E 47 and E 55, have been allowed to retain their pre-1992 numbers, E 6 and E 4 respectively, within Sweden and Norway. These exceptions were granted because of the excessive expense connected with re-signing not only the long routes themselves, but also the associated road network in the area, since Sweden and Norway have integrated the E-roads into their national networks and they are signposted as any other national route. These roads maintain their new numbers from Denmark and southward, though, as do other European routes within Scandinavia. Further exceptions are E 67, going from Finland to Czech Republic (wrong side of E 75 and E 77), assigned around year 2000, simply because it was best available number for this new route, most of E 63 in Finland (wrong side of E 75) E 8 in Finland (partly on the wrong side of E 12 after a lengthening around 2002) and E 82 (Spain and Portugal, wrong side of E 80). These irregularities exist just because it is hard to maintain good order when extending the network, and the UNECE does not want to change road numbers unnecessarily. 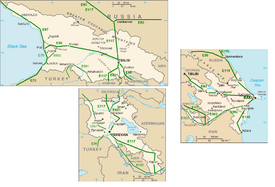 Because the Socialist People's Republic of Albania refused to participate in international treaties such as the AGR, it was conspicuously excluded from the route scheme, with E 65 and E 90 making noticeable detours to go around it. In the 1990s, Albania opened up to the rest of Europe, but only ratified the AGR in August 2006, so its integration into the E-road network remains weak. Where the European routes are signed, green signs with white numbers are used. The E 201 in Ireland. There are different strategies for determining how frequently to signpost the roads. Sweden, Norway and Denmark have integrated the E-road numbers into their networks, meaning that the roads usually have no other national number. 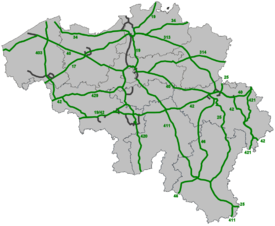 In Belgium, E-numbers are traditionally associated with highways, even though other grade E-roads pass through the country. As a result, the E-number is signposted only on the highway portions of the E-road network, while for non-motorways only the national number (if any) is shown. Serbia has a similar principle. In most of the countries the E-roads form a network on top of the national network. The green signs are frequent enough to show how to follow the roads, but do not usually show how to reach them. In some countries, like Croatia, E-roads are well signposted, but they sometimes follow the old state routes instead of highways. State highways are signposted best. In some countries, like Germany, Italy and Greece, E-roads are signposted only on motorways and main road itineraries. In Ireland the signposting of E-roads is specified in Chapter 2 of the 2010 Traffic Signs Manual published by the Department of Transport, and specifies that E-roads are to be signed on route confirmation signs only. The first E-road numbers were signed in July 2007 on the N11 bypass in Gorey. 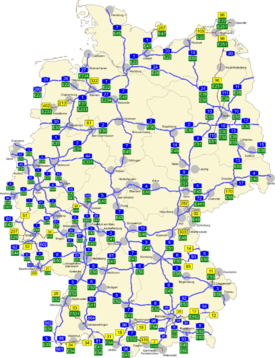 Since then they have gradually spread across the E-road network in Ireland. In a few countries, such as the United Kingdom and Uzbekistan, the E-roads are not signposted at all. Built-up areas shall be by-passed if they constitute a hindrance or a danger. The roads should preferably be motorways or express roads (unless traffic density is low so that there is no congestion on an ordinary road). They should be homogeneous and be designed for at least 80 km/h (50 mph) (see Design speed). Motorways for at least 100 km/h (60 mph). Gradients should not exceed 8% on roads designed for 80 km/h (50 mph), decreasing to 4% on roads designed for 120 km/h (75 mph) traffic. The radius of curved sections of road should be a minimum of 120 m (390 ft) on roads designed for 60 km/h (35 mph) rising to 1,000 m (3,300 ft) on roads designed for 140 km/h (85 mph). "Stopping distance visibility" should be at least 70 m (230 ft) on roads designed for 60 km/h (35 mph), rising to 300 m (980 ft) on roads designed for 140 km/h (85 mph). Lane width should be at least 3.5 m (11 ft) on straight sections of road. This guarantees adequate clearance for any vehicle having a superstructure of width 2.5 m (8.2 ft) which is the maximum specified width in Directive 2002/7/EC of the European Parliament and of the Council which recognize some specific tolerances for some specific countries. The shoulder is recommended to be at least 2.5 m (8.2 ft) on ordinary roads and 3.25 m (10.7 ft) on motorways. Central reservations should be at least 3 m (9.8 ft) unless there is a barrier between the two carriageways. Overhead clearance should be not less than 4.5 m (15 ft). Railway intersections should be at different levels. These requirements are meant to be followed for road construction. When new E-roads have been added these requirements have not been followed stringently. For example, the E 45 in Sweden, added in 2006, has long parts with 6 m (20 ft) width or the E 22 in eastern Europe forcing drivers to slow down to 30 km/h (20 mph) by taking the route through villages. In Norway, parts of the E 10 are 5 m (16 ft) wide and in Central Asia some gravel roads have even been included. In Belgium, for example, motorway E-numbers have taken on the same kind of persistent cultural integration and significance as M-numbers in the UK, or Interstate numbers in the United States. Local businesses will refer to, or even incorporate the road designator in their business name. The annual road cycling race "E3 Harelbeke" takes part of its name from the former E03 (the part between Antwerp and Lille was renamed E17 in 1992). In the road listings below, a dash ('–') indicates a land road connection between two towns/cities—the normal case—while an ellipsis ('…') denotes a stretch across water. There aren't ferry connections at all of these places and operating ferry connections are usually run by private companies without support from the respective governments, i.e. may cease operating at any time. The E-road network in Georgia, Armenia, Azerbaijan. However, the border between Armenia and Azerbaijan is closed due to strained relations between Armenia and Azerbaijan. The E-road network in Belarus. The E-road network in Belgium. The E-road network in Bulgaria. 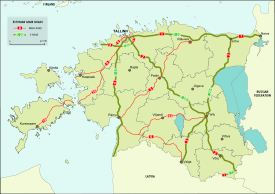 Main and E-roads in Estonia. The E-road network in Finland. The E-road network in Georgia. The E-road network in Germany. The E-road network in Lithuania. 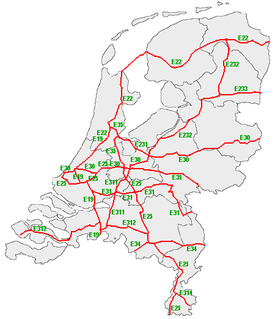 The E-road network in the Netherlands. The E-road network in Poland. The E-road network in Romania. The E-road network in Turkey. 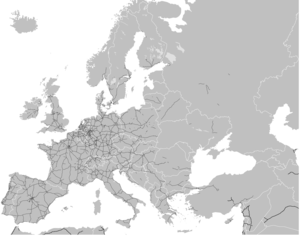 The E-road network in the United Kingdom and Ireland. The E-road network in Ukraine. – 5,100 km (3,200 mi): Brest – Rennes – Le Mans – Paris – Reims – Metz – Saarbrücken – Mannheim – Heilbronn – Nuremberg – Rozvadov – Plzeň – Prague – Jihlava – Brno – Trenčín – Prešov – Košice – Vyšné Nemecké – Uzhhorod – Mukachevo – Stryj – Ternopil – Khmelnytskyi – Vinnytsia – Uman – Kropyvnytskyi – Dnipro – Donetsk – Rostov-on-Don – Armavir – Mineralnye Vody – Makhachkala...also known as "Via Caroli"
– 110 km (68 mi): Corinth – Megara – Attiki Odos (Elefsina – Athens Suburbs – Markopoulo Mesogeas). E80, together with Asian Highway 1, crosses all of Europe and Asia, linking Lisbon with Tokyo. The longest E-road is E 40, which is more than 8,500 km (5,300 mi) long, connecting France with Kazakhstan. The highest E-road is E 008 which reaches 4,272 m (14,016 ft) altitude in the Pamir Mountains in Tajikistan. The highest E-road in Europe is E 62 reaching 2,005 m (6,578 ft) at the Simplon Pass, Switzerland. The lowest E-road is E 39 which reaches 262 m (860 ft) below sea level in the Bømlafjord Tunnel, Norway. The longest bridge on an E-road is the Øresund Bridge (in Sweden and Denmark) on E 20 which is 7,845 metres (25,738 ft). The longest tunnel on an E-road is the Lærdal Tunnel (in Norway) on E 16 which is 24,510 metres (80,410 ft), the longest road tunnel in the world. As of 2015[update] E 16 includes 60 tunnels, covering about 15% of the road's 630 km (391 mi) within Norway. The E 39 includes 8 ferry crossings. The E 39 includes 90 tunnels, 6% of the road's 1,140 km (708 mi) within Norway. 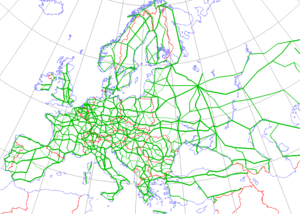 Wikimedia Commons has media related to International E-road network. National Road network (Netherlands) a former system devised to complement the E-road network at a national level. ^ "Declaration on the Construction of Main International Traffic Arteries, signed at Geneva" (PDF). United Nations - Treaty Series. 16 September 1950. Archived from the original (PDF) on 12 August 2014. Retrieved 2010-12-27. ^ "Declaration on the Construction of Main International Traffic Arteries, signed at Geneva" (PDF). United Nations - Treaty Series. 16 September 1950. Retrieved 2012-07-01. ^ a b "E-Roads". Archived from the original on 3 March 2012. Retrieved 5 September 2012. ^ a b c d "European Agreement on Main International Traffic Arteries" (PDF). United Nations Economic and Social Council. 14 March 2008. Retrieved 2010-12-27. ^ "2. Directional Information Signs" (PDF). Traffic Signs Manual 2010. Ireland: Department of Transport, Tourism and Sport. November 2010. §§2.3.34–36, 2.4.108, 2.4.116, 2.5.87. Retrieved 23 November 2017. ^ "Statutory Instrument 2002 No. 3113: The Traffic Signs Regulations and General Directions 2002". HMSO. Retrieved 2010-12-27.